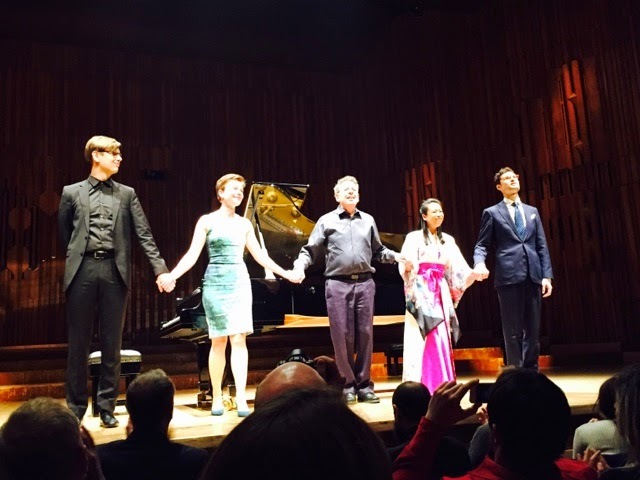 Last night Stuart, Dilwyn and I went to see a performance of Philip Glass's now complete twenty Études for Piano to the Barbican Concert Hall in London's concrete Barbican. The American composer was there himself performing alongside pianists Maki Namekawa (amazing), Timo Andres (gifted), Clare Hammond (orgasmic) and Vikingur Ólafsson (virtuoso). An introspective portrait of the composer over two decades, The Études is an immersive journey into one composer’s personal soundscape as expressed in the depth and breadth of a single instrument. Philip Glass started writing this series of twenty piano pieces in the mid-90s and the final four études were commissioned in celebration of Glass’s 75th birthday in 2012. It is a body of work that has a broad range of dynamics, tempo and emotion. Glass often gets described as a minimalist but this is a rather misleading label. His works are rich with vibrant structures that repeat and syncopate in an almost hypnotic pattern. Joyous. I think Dilwyn enjoyed himself. I'm sure Stuart did. I know I did.